To help maintain your lovely "Selclened" home, why not try these some of these useful tips we have collected over the years? Beer or red wine stains can be an unfortunate by-product of a party. To remove stains, use soda water. To get rid of those brown tannin stains from your teapot, put a tablespoon of bicarbonate of soda into the pot, add boiling water and leave to soak overnight. Rinse out and wash thoroughly before your next brew! Use an old toothbrush to get into those little areas like underneath taps, to dislodge ingrained stains. Remember to clearly label the toothbrush to make sure it does not get back into circulation! Stainless steel sinks, worktops and equipment can be made to sparkle by wiping with a vinegar soaked cloth. 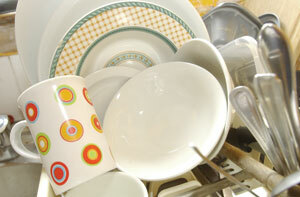 NEVER use scouring pads on any stainless steel sink! Soak a cloth in hydrogen peroxide solution and rub the stain gently. For really stubborn bloodstains rub a paste of corn flour into the stain and leave it in the sun. Simply take a plastic bowl, fill it with cheap hot white vinegar ( heat in a saucepan) and immerse the shower head in the bowl. To keep the bowl in place, tape to the shower head using masking tape ( this will not spoil the chrome). Leave it for 1 hour- no longer, Remove the tape and the bowl. The lime scale will be loose, some will be in the vinegar. Take an old toothbrush and scrub the shower head. Remember to run the shower to remove any excess vinegar. Wipe the outside of the shower head with a wet cloth, and buff up using a dry cloth. Pour down bicarbonate of soda down the sink, followed by some clear vinegar. This solution should fizz and bubble up and give your pipes a good cleaning out. We are all finding there is a lot of ants about I recently had a lot around my front door step and up the walls - good tip is to fill a bucket of water with bleach solution and add some cleaning liquid e.g. flash take a brush give your steps and walls a good clean let it dry and repeat again I found once all was dry no more ants to be seen. Keeping plant pots with dead flowers may be a mistake, as ants like to nest in the dry area. Once you find plants can no longer be looked after, dispose of the plant and empty your pot. Firstly sprinkle bicarbonate of soda over the grill to act as a natural deodoriser. Then take some tin foil rolled into a ball and scrub the grill as hard as you can. Wipe off the excess until the grill is shiny and clean. If you can't bear the smell of conventional oven cleaners, get rid of oven grease by using half a grapefruit dipped in a plate of table salt. Watch the grease come off and enjoy the sharp clean smell of your oven! Are you bothered with Wasps making hole in wall outside your house !! Try Terro Wasp & Hornet killer. Its a Foam - do this at night when wasps are not around and they've gone back to their nest to settle It kills the wasps inside as well as those returning.- worth a try !!! We love learning new cleaning ideas. Why not contact us and give us your tips so we can include them on our site?